In 1906, John J. “Black Jack” Pershing (his nickname was conferred when he commanded a regiment of black cavalrymen) was personally promoted in one leap from captain to brigadier general by President Theodore Roosevelt. When the U.S. entered World War I in 1917, Pershing was chosen to command the AEF, all of the land forces sent overseas to fight the war. 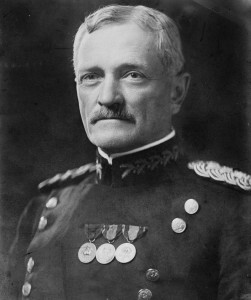 Pershing virtually created the AEF, and he successfully resisted French and British attempts to preempt command of the force. Emerging victorious from the war, he was promoted to the specially created rank of general of the armies (six stars), the highest military rank ever conferred on an American officer.